Listening to the new instrumental record by HELEN MONEY, In Tune, is a completely different kind of instrumental experience. 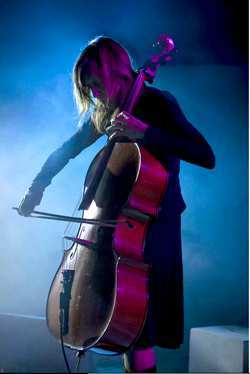 Alison Chesley is a Chicago-based cellist who earned her rock credentials with the 90’s alternative band, Verbow, then started performing with world-rockers, Poi Dog Pondering, and even recorded with nu-metallers, Disturbed. If you’re expecting just cello renditions of rock n’ roll songs, you won’t hear that, but you’ll hear music that’s completely unafraid to reach into dark places and her mixture of pizzicato, heavy bowing, distorted leads over beds of soft strings is a fascinating listen of how to channel rock’s traditionally guitar-oriented aggression through an instrument that gets most of its heavy metal recognition from the bridge section of Whitesnake’s “Still Of The Night”. Part of Alison’s live show is her use of electric guitar pedals and that she plays standing up, creating an experience that most people are used to seeing with a lead guitarist, but she doesn’t want her instrument to be what sets her apart. “I want people to come to see what I have to say through my instrument. Don’t come because I’m playing cello, even though it’s a great instrument. I had someone asked me once ‘why they should get me versus Apocalyptica?’. I thought they should get it because they want to hear what I have to say and not because of the cello.” HELEN MONEY will be appearing in Madison on Wednesday 11/25 at The Frequency and in Milwaukee on Friday 11/27 at The Cactus Club.